Up to now, the effect of breaking a glass required the use of a special table, or of a device inserted into a tray, usually of an obviously large size. 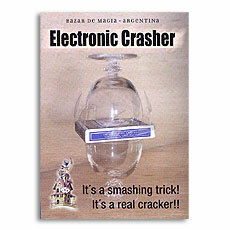 Electronic Crasher produces the same effect but with a small device that may be hidden in a card case, a packet of cigarettes, a book, or in any other suitable location. Electronic Crasher is an electro-mechanical device that is 100% reliable. It is powered by two batteries (included) and has a timer that will trigger the event at the moment you decide (a window of 10-45 seconds).